I tried the up-front approach to turn John into a vegetarian, but that failed miserably. (But I must admit that when I attempted to serve him quinoa, the look of horror on his face was pretty entertaining.) So I’ve had to resort to trickery. I’ve learned that the key to fooling a carnivore and his stomach is to serve incredibly hearty, filling, flavorful meals. My friend Rhonda sent me the following Chili Al Mole recipe, which is a truly delicious Mexican mole-style chili that’s rich, satisfying and has some secret ingredients (cinnamon and cocoa) that open like a flower in your mouth. 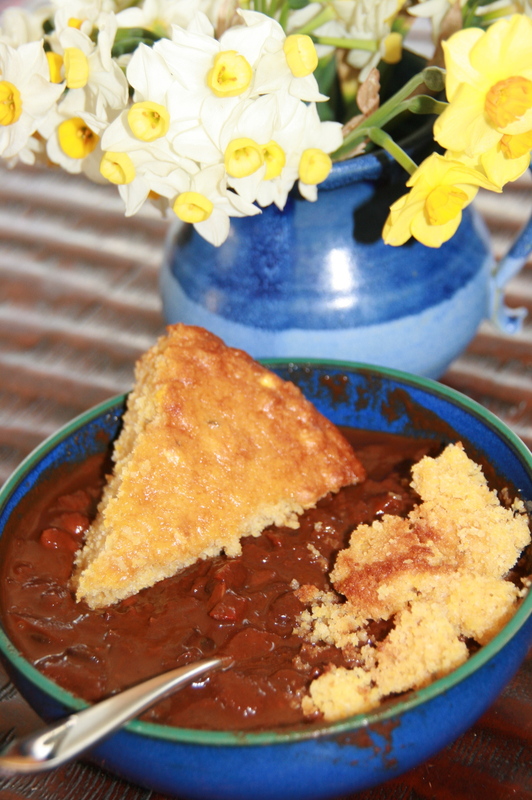 I strongly recommend serving this chili with a nice cornbread crumbled on top since it adds just a hint of sweetness and an interesting texture that truly completes this filling meal. And as it happens, I also have a fantastic recipe for a deeeelicious vegan cornbread that’s accented with honey and sage. This meal is a little more involved than my typical 30-minute or less dinners, but I think it’s worth it. The look of ecstasy on John’s face definitely makes it worth it for me, as does the fact that this is a “whine-free” dinner – hurray! I hope you like it! Preheat a large pot (at least six quarts) over medium-high heat; add and heat the olive oil. Add the onions and peppers and sauté for two minutes, then add the garlic. Cook for 8 minutes, until onions are soft. Add the chili powder, cinnamon, and cumin, stirring constantly for another minute. Add the tomatoes, cocoa powder, and molasses. Stir to blend, then add the beans and vegetable broth. Cover and bring to a gentle boil, then lower the heat and simmer for about 30 minutes, stirring occasionally to prevent scorching. Allow to sit at least 20 minutes before serving. While it’s sitting, prepare cornbread – this adds so much to the chili, it’s crazy. This is a vegan cornbread recipe adapted from one I found on food.com (which apparently was created by an 11-year-old – impressive!) It’s quite good, especially with my little additions of honey and sage. It’s simply divine on the Chili Al Mole. Preheat oven to 425 degrees. Spray 8 inch baking dish with oil. Bring water to boil in a saucepan. Add the ground flax seed, reduce the heat to medium-low, and simmer the ground flax seed in the water for 3 minutes or until thickened, stirring occasionally. Set aside. In a medium bowl, mix together flour, cornmeal, sugar, baking powder and salt until well combined. Add the ground flax mixture to the bowl, along with soy milk, honey, sage and oil. Beat until just smooth. Pour into baking pan and bake for 20-25 minutes or until toothpick inserted into the middle comes out clean. Cool on wire rack for 10 minutes, then turn out of pan and continue cooling for an additional 10 minutes before serving. ← Is fake meat edible?